Farmers in Gauteng are already feeling the pain brought by the current dry conditions around the country. With livestock starving, and fields lying empty, they are facing an economic disaster. Many will not make it to the next planting season. They are praying for rain, but it must come soon; if seeds are not in the ground within ten days, it will be too late for a decent harvest. By BHEKI C. SIMELANE. “This is the worst drought I have seen in my over 40 years’ experience as a farmer in this country, since I was a boy”. So said farmer, Hannes Geldenhuys, as he cast his eyes up and down his maize field. He is hoping for a miracle. 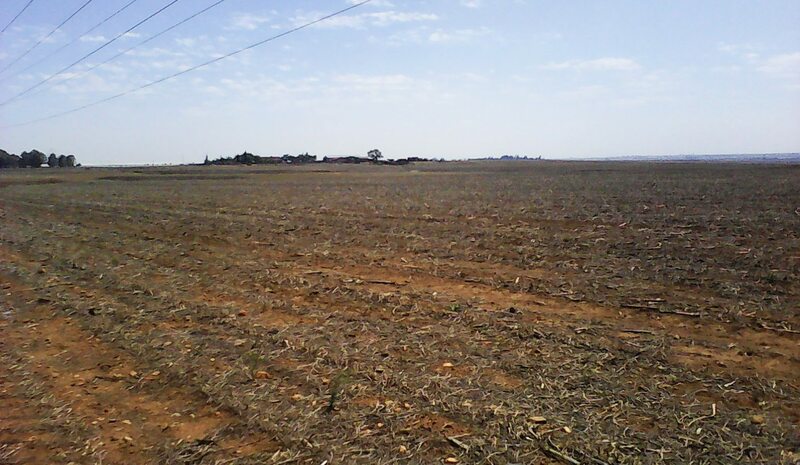 The maize fields on his farm, near Heidelberg, should have been planted as far back as September, or early October, but they remain dry, and in a state of neglect. Like most farmers in the country, Geldenhuys survives on farming mainly cattle, beans and mealies, but the lack of rainfall has left him and his fellow farmers bewildered and scared. Geldenhuys belongs to the Suikerbosrand Farmers Union, who spoke to the Daily Maverick on Wednesday. They asked to speak as a collective, because, they said, they all shared the same fears. “The best farmers in the land are struggling, you can imagine the impact on ourselves,” they said. The unprecedented heatwave continues to scorch livestock and plants across South Africa. The South African Weather Service warns that it could last until Saturday. Given the severity of the situation, however, even a little rain won’t help. Farmers need at least 40mm to begin planting, and then consistent lighter rain to maintain ground moisture. Most South African farms are irrigated by rainwater, which means there is little that farmers can do to prepare for extreme weather like this. “It all depends on what the person is farming with. If that person is a crop farmer, it doesn’t rain, then he can’t plant. So they must watch the clouds and pray for rain. That’s about all he can do. Personally there’s nothing that the farmers can do. If that person is doing mixed farming, with cattle, they can still sell cattle and get some money. If it’s dry, it impacts everyone in the country, just because there is no rain. It’s not just the farmers, everybody in the country is suffering. If you look at small-scale subsistence farmers, what is going to happen to them?” said Kosie van Zyl, senior advisor to AgriSA. The consequences of a general crop failure could be devastating for South Africa, both now and in the long term. There are roughly 18,000 commercial farmers in the country, who each provide on average enough food for 6,000 South Africans. For every farmer that fails to produce, 6,000 South Africans will need to find another source for maize, bread, vegetables, meat, eggs, and milk this year. For every farm that goes bankrupt, 6,000 South Africans may have to find another food source permanently. The farming union members acknowledged that small-scale subsistence farmers will be the first to feel the impact of the drought, but that they too are in danger of losing their livelihood. “Unlike farmers in Europe, where they get subsidies, we don’t. All we can do is pray and believe that something happens very soon. We dedicated so much time, energy and work but still it’s not in our hands to guarantee we will get a good harvest,” they said. The knock-on effects of a poor harvest affect every area of the farm. For example, without the income from the crop, both long and short-term farm employees may not be paid. And cattle on the farm suffer from the lack of both water and fodder, forcing farmers to sell them cheaply at auctions. For South Africans this means that there will be lots of meat in the short-term, because farmers are either selling their livestock or slaughter them, but in the long-run there could be a serious meat shortage. So far, the farmers say they have not received any help from government, and are sceptical that the recently announced farmer’s bailout fund will help. They say that they are still waiting on their VAT refunds, and if these cannot be processed timeously, how then can the government be trusted to distribute extra money? Photo of Heidelberg fields by Bheki Simelane.